From the crispy, crunchy texture of the vegetables, to the tangy vinaigrette, this marinated fresh vegetable salad is always a hit. My mom gave me this recipe for marinated fresh vegetable salad. It’s one of my all time favorites. From the crispy, crunchy texture of the fresh vegetables, to the tangy vinaigrette, this recipe is always a hit. Whenever I take this to a pitch-in, I receive rave reviews. We used to camp a lot with two other families when the kids were younger. Mike and Lynne (one of the couples we camped with) came over last night for dinner. I made this recipe so I could take pictures to post on my blog. Lynne spotted the salad on the counter and enthusiastically said, “this reminds me of our rv trips – so many happy memories”. Mike picked out veggies and ate right out of the container – that’s my favorite way to eat this salad. Every time we camped, I would make a big container of this salad as well as fresh salsa and chicken salad. Be on the lookout for my chicken salad recipe which I’ll post in a few weeks. Although I would bring this salad out for lunch and dinner, it’s also makes a great snack. I make this in a big plastic container with a lid. Mix it all together and shake the container to keep the vinaigrette coated on the vegetables. To keep the container full, replenish with additional vegetables in the vinaigrette for a few days. Normally, I use cauliflower, broccoli, cherry tomatoes, and carrots. Use your favorite vegetable combination. Just about any vegetable is great in this salad. 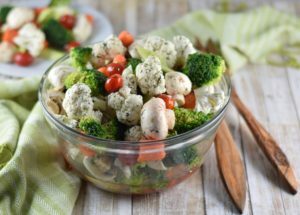 Other vegetables I’ve used in this salad include mushrooms, artichoke hearts, black olives, peppers, cucumber, sugar snap peas, celery, green onions, and radishes. 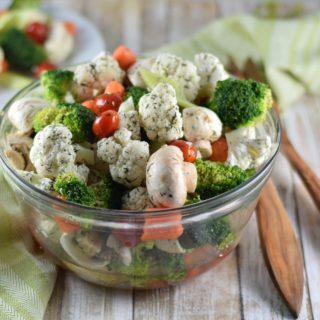 I've used combinations of the following vegetables: cauliflower, broccoli, mushrooms, carrots, celery, cherry tomatoes, radishes, peppers, sugar snap peas, artichoke hearts, black olives, cucumber. To make the dressing, whisk together the 1st 6 ingredients. Or place the 1st 6 ingredients in a jar with a lid and shake the jar to combine. 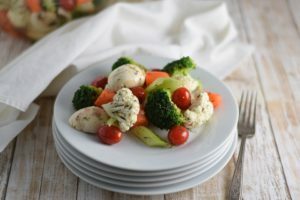 Place the assorted in a large bowl and pour the dressing over the vegetables. Let marinate at least 1 hour before serving. Thanks Patsy! I’m glad you enjoyed it.